The blackberries must be stored at a temperature around 0ºC and relative humidity around 90-95%. In these conditions they may last for 2 to 5 days. This species is not suitable for the application of ethylene in order to stimulate maturation. The use of modified atmosphere during packing and ship transport reduces the growth of the fungus Botrytis cinerea and other organisms, and reduces the rate of respiration and softening of the blackberries; therefore, this method lengthens the postharvest life. Previous to the application of modified atmosphere it is necessary to cool the fruit down. The suitable conditions for this process are 15-20% of carbon dioxide and 5-10% of oxygen. 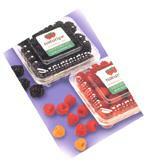 It is essential to maintain the cold chain, since this produce is highly perishable. Among the several problems affecting the blackberries during the storage we find the loss of water, the " leakers" and other alterations caused by a bad handling of the controlled atmosphere. The main problem are the diseases caused by the fungi Botrytis cinerea and Rhizopus stolonifer. Loss of water: the berries are very sensitive to this problem, that may be diminished if the moisture levels are kept high, along with as optimal temperature. Leakers: this term refers to the blackberries that exude liquid. This problem may be due to physiological decompositions. Alterations caused by controlled atmospheres: if the berries are subject to oxygen concentrations below 2% and / or carbon dioxide concentrations over 25% there occurs a loss of taste and browning of the fruit. Botrytis cinerea: this fungus is a very common pathogen in the berries. It may grow even at temperatures of 0ºC. Rhizopus stolonifer is another fungus that attacks berries. It stops growing at 5ºC. The means to control these fungi are by fast cooling and using atmospheres rich in carbon dioxide.